This is a truly international group led by bassist Andreas Dreier from Denmark with guitarist Bjorn Vidar Solli from Norway and Australian drummer Adam Pache. The music on this album is inspired by the great Ahmad Jamal Trio which consisted of Israel Crosboy on bass and Vernel Fournier on drums along with Ahmad Jamal on piano. The Ahmad Jamal recording in particular which Andreas Dreir had in mind was the 1958 “Ahmad Jamal at the Pershing which included Poinciana and is included on this release. All the tunes included on the album are well known standards apart from two Thelonious Monk composition but have little in common with the composer’s approach to the music. 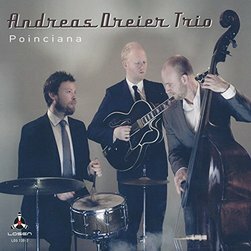 As this is a bass led trio there is the obligatory bass solo on every track which has a tendency to break up the flow of each number, that is not to say ther is any deficiency on the part of Andrea Dreier but a little goes a long way. Bjorn Vidar Solli is a melodic and fluent guitarist who carries the melody well who is really the star of the album. The drummer Adam Pache makes his presence felt without being in your face, his brushwork is immaculate. The opening track “Lullaby of the Leaves” is beautifully paced and although the rest of the album is very much on the same level it really does match this number until we reach the final title track “Poinciana” which brings out the best in the group. This is a very pleasant album but you really have to be a lover of guitar trios to appreciate it to the full.